You can enjoy this incredible deal every Wednesday, Friday or Sunday until 24 August 2018. So, grab a friend or loved one and make an epic night of it! This offer is limited to Barnyard Theatre Productions only and excludes one-off shows and events. Select any Barnyard Production show date until 24 August 2018, and in the booking process you will be promoted to choose the package deal option. All package sales and payments will be directed to the Barnyard Theatre. Telephone, walk in and online bookings (on the Barnyard Theatre website) are welcome but is subject to availability. Telephonic bookings are open Monday to Sunday from 09h00 to 17h00. This offer is only available at the Barnyard Theatre Silverstar. Group bookings are also available and can be booked directly with The Barnyard Theatre. The offer includes two show tickets, one large *pizza to share and a bottle of *wine, or two *soft drinks. (*Pizza: standard pizza, no additional toppings. Wine: Unbelievable red or white wine. Soft Drinks: Coca Cola products / Liqui Fruit / Lipton Ice Tea / still or sparkling water). The offer is exclusive to selected Barnyard Theatre productions only (20 April 2018 to 24 August 2018) and excludes kids shows, once off shows and special events. The offer is not transferable once the booking is confirmed. The offer is available for Barnyard show dates, every Wednesday, Friday or Sunday. Bookings are not transferable, and cannot be sold for cash. No refunds or credit notes will be issues for bookings cancelled within 48 hours of the show. A booking which is cancelled prior 48-hour deadline will be issued with a credit note only. No beverages, alcoholic or non-alcoholic, may be brought into The Barnyard Theatre. The Barnyard Theatre reserves the right to cancel or move a show without prior notice. All bookings must be made and taken up before the offer expires on 24 August 2018. 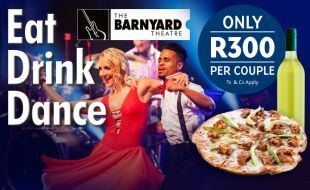 The Barnyard Theatre offer cannot be used in conjunction with other promotions or Rewards discounts, or Barnyard Bucks™. Any person transgressing the rules of Barnyard Theatre’s "Eat, Drink. Dance" offer will be excluded from all future offers at Silverstar Barnyard. In the event of technical failure to the method or device, irrespective of the cause, another suitable method or device will be used, at the sole discretion of Barnyard Theatre Management. Every participant in the promotion shall be deemed to have acknowledged and accepted the rules by virtue of their purchase of the offer. No online reservations could be made 24 hours prior to the show time. Contact +27 10 593 0744 to assist with your reservation. Any person who has been issued with a Refusal of Entry order, or who is self-excluded, or who fall into category of excluded persons, is expressly prohibited from participating in Silverstar Casino.